Mike: I’ll be honest I picked this game up from our FLGS purely on the box cover and that it was a cheap dice filler game. 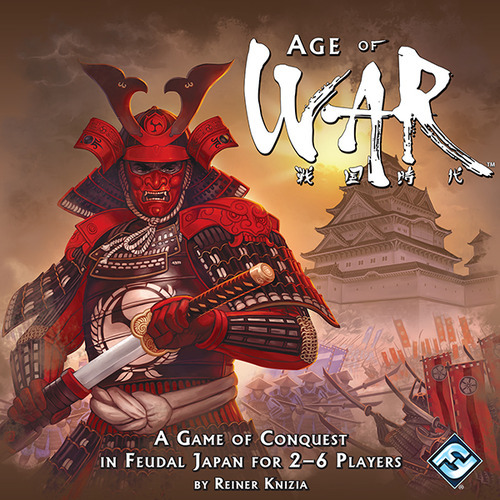 In Age of War you will be assuming the role of daimyos conquering castles and uniting warring clans. If you have ever played a game called Risk Express (a travel version of Risk by Hasbro) then this is essentially the same game that has been given a Japanese reskin. During the game you will be fighting for 14 castles in the centre of the board. 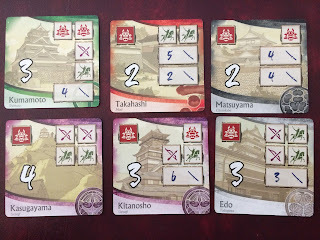 Mike: So in the example below you would need to roll 1 Daimyo, 1 Archer and 1 Cavalry. 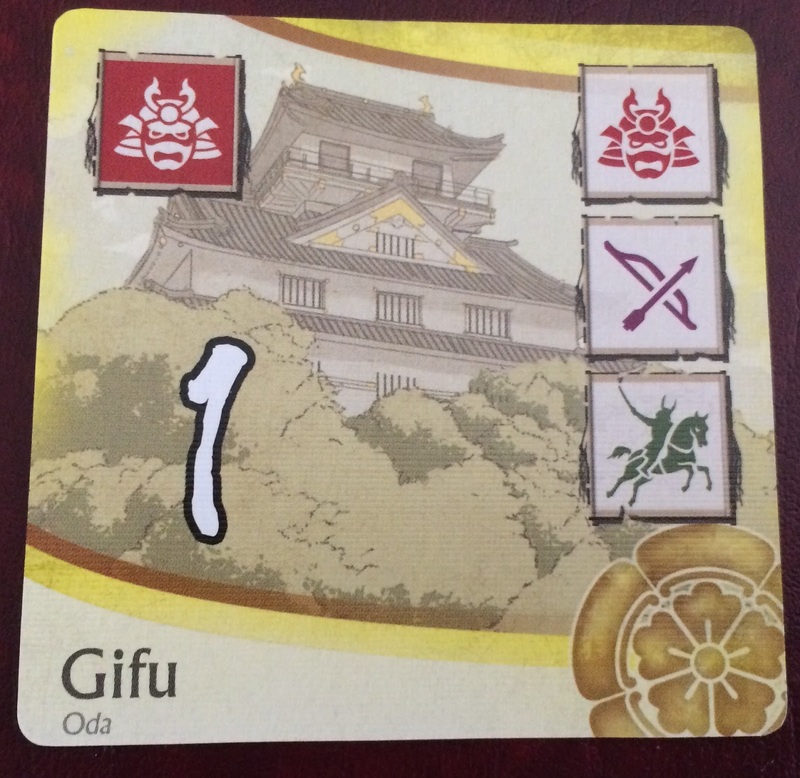 You would only need a second Daimyo for the top left corner if you were attempting to conquer this castle from your opponent’s side. Conquering this castle will get you 1 point as indicated by the white number on the card. Something to keep in mind is your castles are not safe they can be attacked at any time from your opponents. Whilst it’s trickier to do it can be worthwhile to stop your opponent conquering a clan. 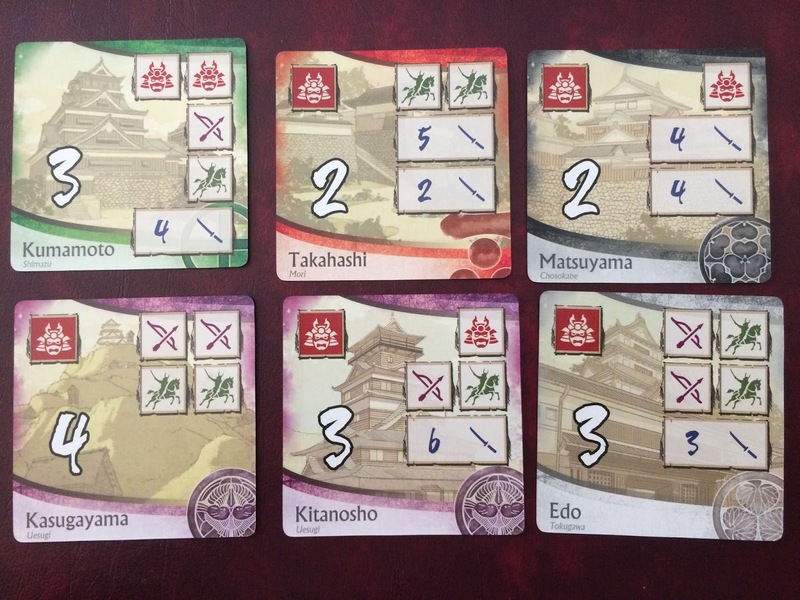 David: Some of the clans can be tricky to complete as they have a lot of cards. It can be really frustrating when you are one away and your opponent steals a castle from you. Mike: Essentially this is going to be your main goal of the game. A clan is conquered when you have all castles of a particular colour. Once you have achieved this you can flip them over and score the value on the back. These are now banked and cannot be taken from you. So as you can see conquering clans is the way to secure points and win the game. 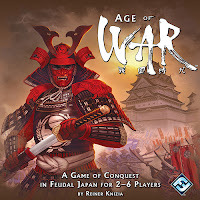 Age of War is a pure luck based game there is very little strategy involved. For me there is something lacking here and there are other fillers I would prefer to play. That being said it is meant to be a filler dice game and wouldn’t be a bad way to introduce gamers to other dice games like Elder Sign or Alien Frontiers. Do we recommend it – well myself no I think there are other games around the same price point that are better to play in 15-30 mins. I personally would rather play Star Realms. David: I really like this and do recommend it though. It’s quick to play and not complicated. Sometimes I like to play a game that is easy and doesn’t have too many rules especially if we don’t have a lot of time. One thing I noticed is this game is for 14+. We are not sure why it is. 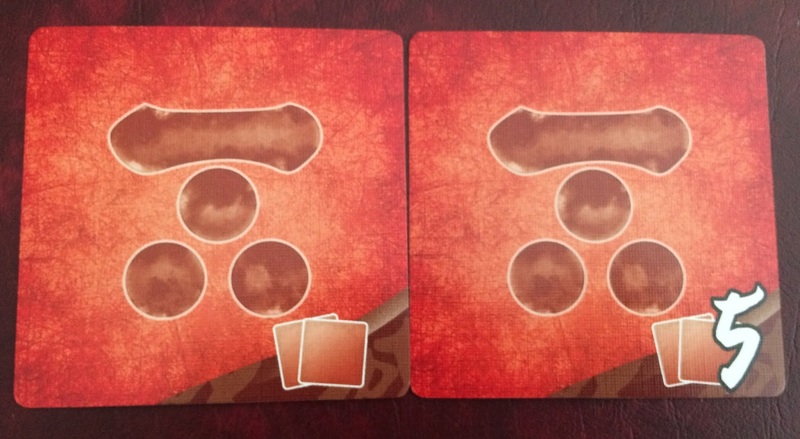 There is no reason why this couldn’t be played from 8+. It is not a complicated game. Mike: So there you go this one has a split decision. Sounds like a historical version of Dungeon Roll - purely luck based filler without much strategy to it. I like the idea but I'd get bored easily with something that relies to heavily on luck. Yes I think that is what kills it for me. I never feel satisfied after playing it it’s too much luck for me. I haven’t played dungeon roll but I will give it a miss if it sounds like this.